I’ve been away from the blog for quite some time, but that does not mean that I have been unproductive – it has been a summer of crazy projects and quests. The most recent has been my nigh-quixotic adventures in bagel making. 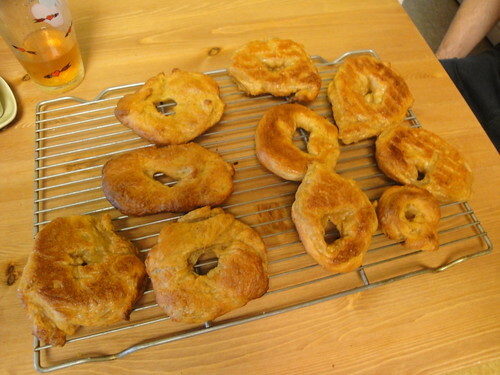 Bagels are a notoriously difficult baking project. In part this is because they are a multiple step process that includes kneading, proofing, boiling(! ), and finally, finally baking. The other side of the difficulty is in determining what, exactly, constitutes a “proper” bagel. How dense should it be? How chewy? How shiny should the crust appear, and how is that shininess best accomplished? While I have perhaps not yet attained perfect bagel nirvana, I did ascend several levels on this quest, going in three recipes from something that could only be charitably referred to as a bagel to a baked good that anyone could identify clearly as having bagelness. Instead, we’re going to play “spot the difference” and catalog my failures and final relative success. These bagels are less flat than the other bagels. But, they’re still pretty flat. 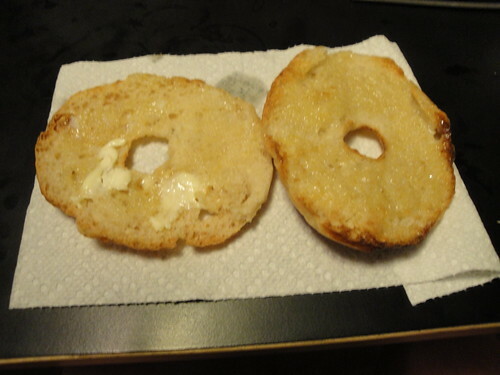 You can see they’re not as holey as the first guys – we’re getting to a little more bagel uniformity. But they’re still. Not. Right! 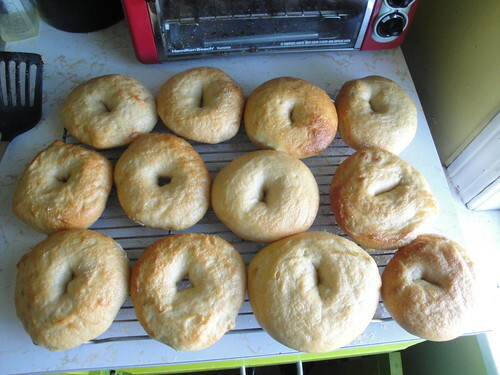 So, fine, I guess I am embarking on a two-day bagel project, in part because besides the advice from my friend online, I research “flat bagels” and find out that a key step is letting them proof overnight in the fridge, which is a step in neither of my two previous recipes. 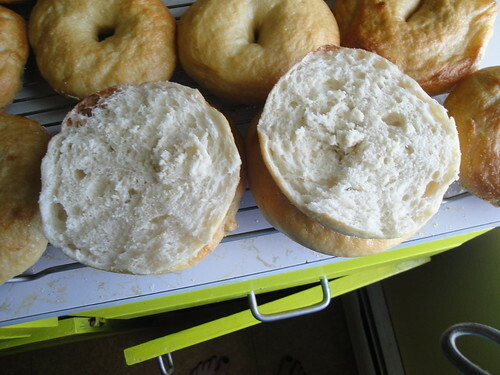 Apparently by retarding the yeast production, you don’t get such big pockets of air (see the big holes in bagel 1?) and so they don’t blow out and fall when you bake ’em. FINE. Mr. Reinhart’s recipe as interpreted by Smitten Kitchen it is. Still the high gluten flour, still sweetened with malt. We also did a little shaping experiment – half with the hole punched out, half with the snake/ring combo. Two things to notice here. 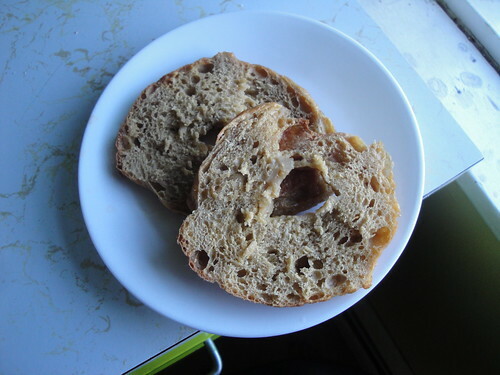 One – I finally have something that looks like a bagel! Two – some of them are still a little lumpy. Turns out the snake/ring ones ARE smoother than just poking a hole through the dough! 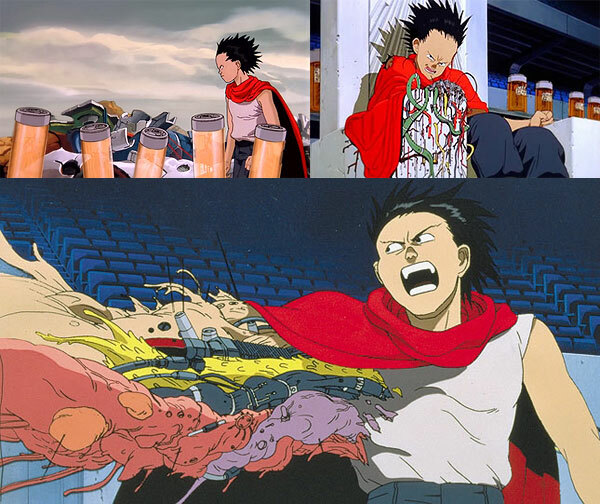 I don’t know why for certain, but I have theory that it has to do with the air escaping again, because when I put the punched out ones in the boiling water, the dough bulged out like Tetuso’s arm in Akira. I think when you make the snake before the ring, you squeeze out that excess air and it can rise more gracefully. But it’s just a theory. Look at that beautiful bread! I still have some playing around to do – I haven’t tried toppings, yet, and I kind of liked the molasses flavor of my first try – maybe I can do half malt, half molasses? 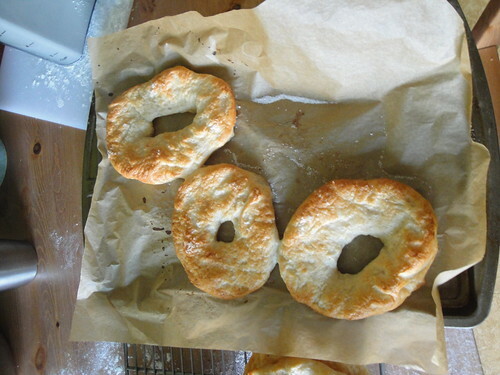 Either way, I’m no longer tilting at windmills – I can make an honest-to-god bagel at home! Because it has been a shamefully long time since I graced you with an update, I have many things I could write about right now. I cracked the code on what is nearly perfect chili, made my own tonic water, and baked some truly fabulous peanut butter cookies. But I feel that we must begin at the beginning, and that is a lovely class I attended on punch-making in December with my good friend Nandi and her husband, the Baby Panda (BP). 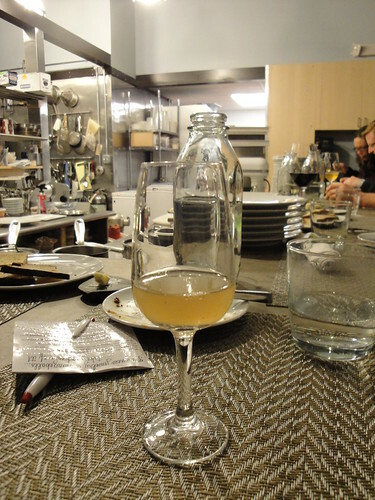 Nandi had found the class via Slow Food Boston. Slow Food started in Rome back in 1986. as a response to a McDonald’s being built near the Spanish Steps. The opposite of fast food is, you guessed it, slow food. What began as a reaction to international big business interests became over time an advocacy group focused on “Good, Clean, Fair” food. 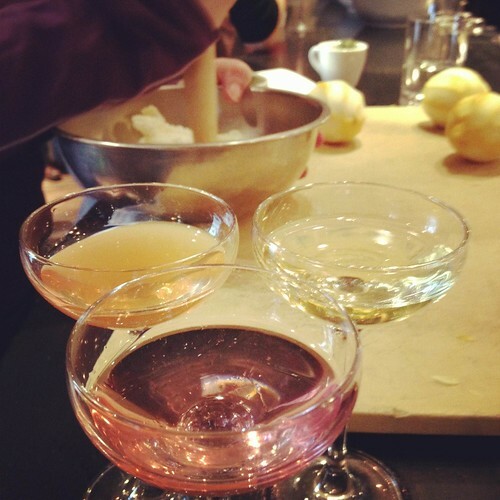 The Boston chapter apparently also has some cocktail enthusiasts, however, and they arranged a punch-making class at perennial Adventures in Food favorite Craigie on Main. When we arrived at Craigie on an extremely cold, blustery day, bar manager Ted Gallagher greeted us with Charles Dickens Punch, served hot, sweet, and spiced. 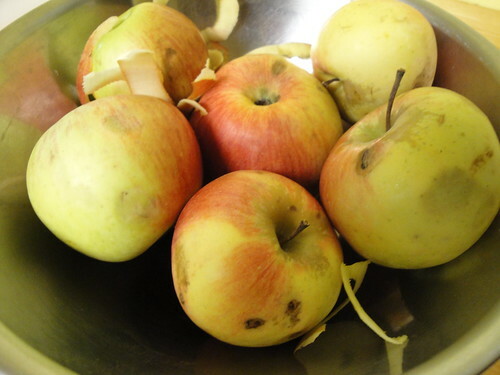 (Sadly, you mostly get the aftermath, because it was very tasty. Loved the use of the rosemary sprig to simulate pine branches!) 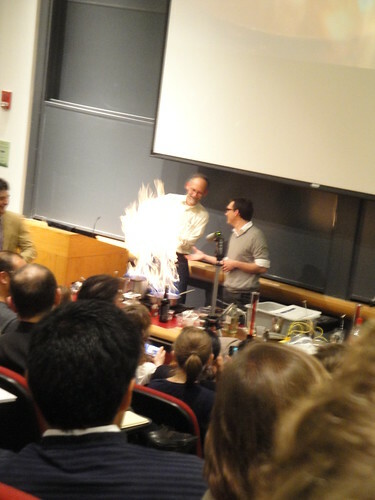 Like the Red Hot Ale served at the Science of the Cocktail lecture, this is a drink that involves setting things on fire, so we didn’t actually get to watch the process of making it (though there was some cell phone video footage), but it was a nice way to kick off the class on a cold winter day! Ted quickly got us started making an oleo saccharum, the base of most classic punches. 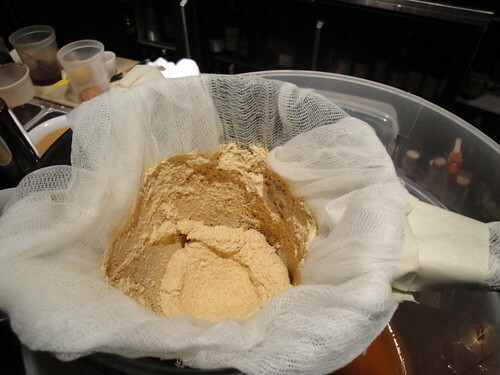 Oleo saccharum translates, quite literally, as oily sugar, and it’s the product of taking some citrus peels and some sugar and first muddling the hell out of them,and then leaving them alone for a while. 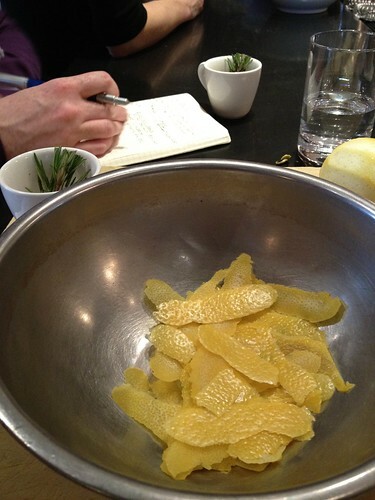 You have to peel the citrus carefully to get as much oil and as little bitter pith as possible. 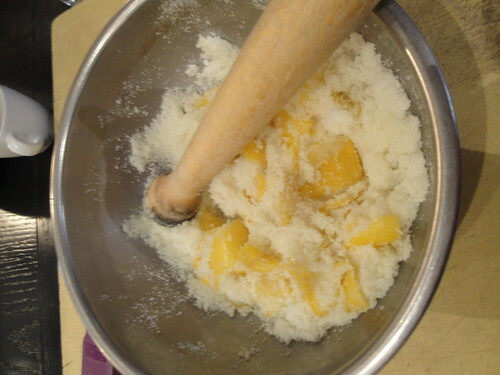 Next, you dump a bunch (carefully measured, of course) of sugar in and start muddlin’! I confessed to the group that I secretly sort of love to muddle – sure it’s tedious, but it’s satisfying and oddly cathartic. This earned me control of the muddler for most of the class. I think the others were afraid of it. 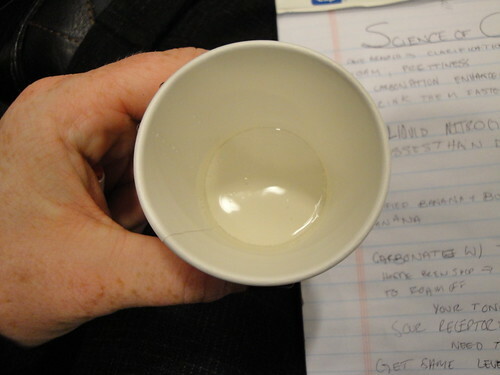 While we muddled away, Ted brought out some Milk Punch for us to sample. They’d made three kinds. (You can see my hand, muddling like a fiend in the background of this shot. Obvi, I did not take this picture. It, and some of the others in this post, were taken by the BP and his fancy new phone. Thanks, BP!) The orange glass was strawberry milk punch, with strawberry bourbon, black tea, and dehydrated strawberry powder. The pink was hibiscus gin with lemon, sage, and apricot liqueur, while the yellow was rum-based, with toasted coconut and pear. I like the orange the best, and the yellow least, due to my mixed feelings regarding coconut. 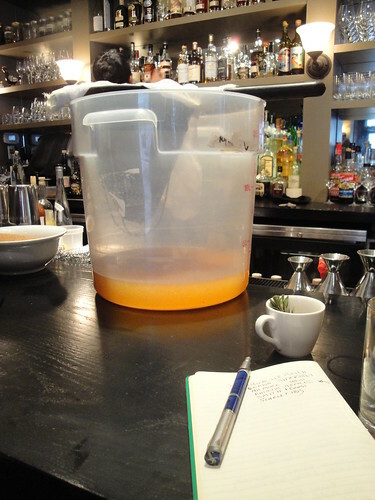 In case you’ve forgotten what milk punch is, basically you combine a liquor, milk, and citrus to coagulate said milk. You strain off the resultant solids and get a clear but creamy tasting product that tastes like whatever you put in. It’s a bit time-consuming, so Ted showed us the process, but the samples had all been prepped well before hand. You know what’s gross? Coagulated milk solids. Ted told a horrifying story of a bartender who battered and fried those things. I know it’s the basis of cheese, but yuck. Despite my complaints, however, I really want to make this myself. 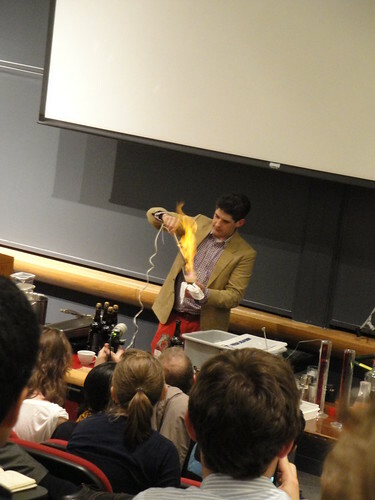 It’s so wonderfully mad sciencey. 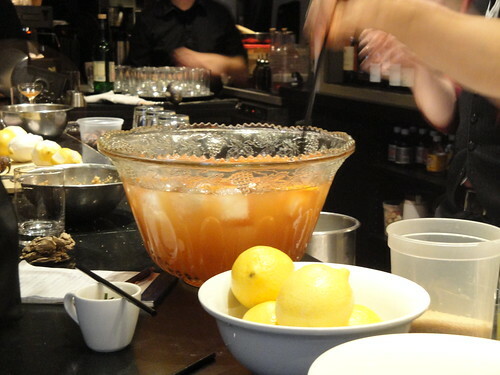 For the final punch, Ted demonstrated that punch is really all about ratios – if you understand the proportions (about 3 lemons to 750ml of alcohol) you can throw in whatever flavors strike your fancy and be just fine. 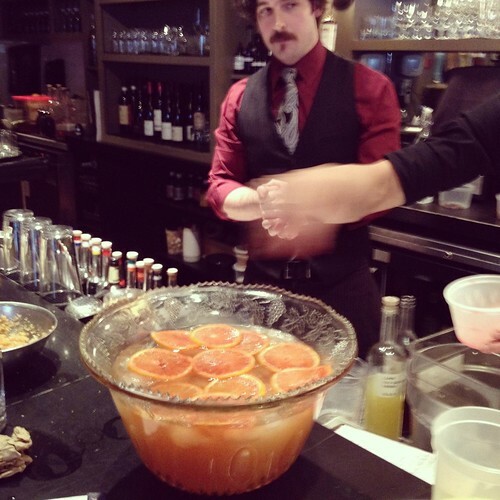 We made a sort of punch by committee – Ted mixed, we told him what spirits to use. By all rights it shouldn’t have worked, we had so many assertive liquors in there. Balmore Scotch, with the iodine smell of peat, the funk of Batavia Arack and Smith and Cross rum, two kinds of citrus – but when it all came together it was like magic. All in all, this was a great class with a good mix of hands-on-work and samples. I can’t wait to have a big party and try out some of the principles – it should be great! Have I talked to you guys about Food 52 yet? Started by two New York Times food writers as a project to create the world’s first “crowd-sourced cookbook,” the site is a pretty fantastic resource for recipes, handy cooking tips, and equipment reviews. Think Cooks.com meets Serious Eats with an Gourmet aesthetic and you’ve kind of got the idea. They have this feature that I am totally in love with called Genius Recipes. The basic idea is that they’re supposed to come from the stars of the food world and really change the way you think about cooking. What I like about them, however, is how shockingly easy so many of them are – which I guess DOES subvert the idea that for something to be great cooking it needs to be complicated. Many of the entrees appear to fall under the “five ingredients or fewer” category, which makes them ideal for a busy weeknight. However, I didn’t get around to trying any of them until I saw this one. What was so special about it? Well, for one thing, I just bought the book that it came from, Judy Rodgers’ Zuni Cafe Cookbook, this summer at the flea market. I bought it because it was a dollar, and because it contains inside it one of the most magical recipes for chicken I’ve ever enjoyed, as prepared for me by good friend and excellent cook Eric Lintz. And yes, I made that chicken and yes, it was amazing, and yes, I will share that recipe with you one day, but not today, because today is all about the applesauce. 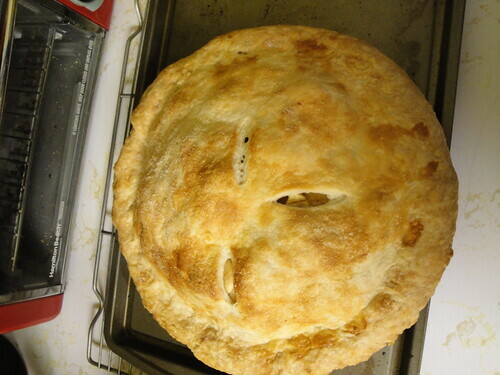 Which gets to the other reason that this was the Genius Recipe that finally got me cooking – I’d bought 10 lbs of apples for $7 at the Farmer’s Market, and there are only so many pies a lady can bake. 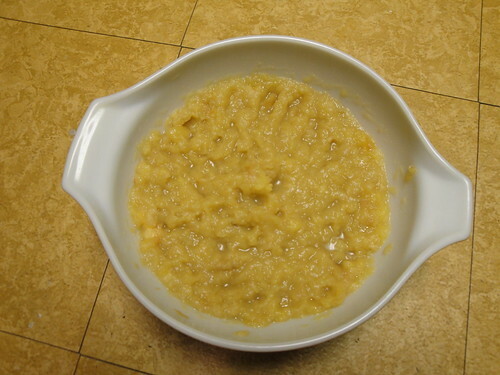 The apples were Ginger Golds from Kimball’s Fruit Farm, and they made such a good pie that I knew they’d make great applesauce, and this recipe seemed to be the one to go with – simple, letting the apple flavor shine through. 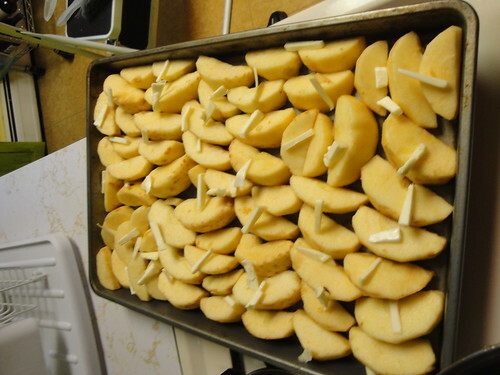 So I peeled them, then cut them with my handheld corer/slicer. 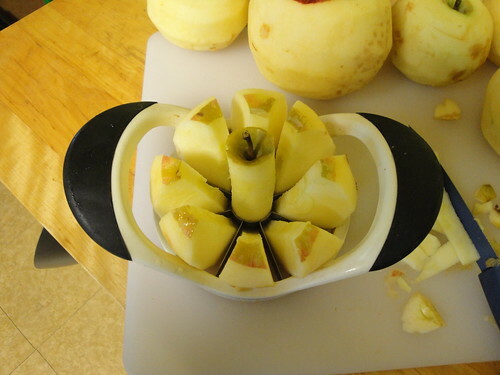 Normally I like to use my crank peeler/corer/slicer, but I needed bigger pieces for this. These were tossed with the tiniest amount of sugar and dotted with butter slivers. Into the oven they went! Easily the best applesauce I’ve had in my life. The roasting gave a caramelized, toasty flavor to the sauce that, combined with that little bit of buttery richness, was borderline addictive. And it all took about 45 minutes, mostly right in the oven. Truly genius! When last we left our intrepid heroines,their senses had been tantalized by two of their five-course Journeyman meal (with a little, delicious lardo interlude). Tune in now for Journeyman, Part II: The Entree Initiative. Our next course was the fish (no shells! 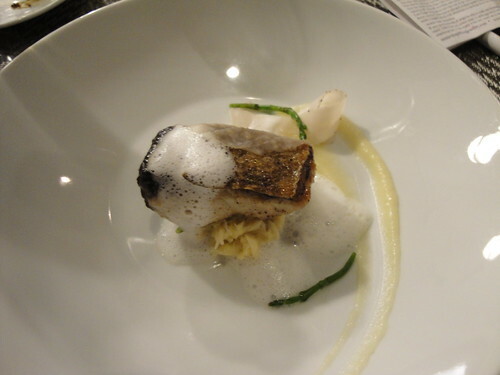 : bluefish atop salt cod, with sea beans, a muscadet foam, and more of that heavenly lardo. There are people in the world who don’t like bluefish, finding it too oily. I am not one of these people, perhaps because I’ve only ever eaten bluefish in nice restaurants, where they know what to do with this oiliness – basically use it to make the crispiest, most delicious fish skin of all time. The sea beans and cod added a pleasant saltiness to contrast with the sweet muscadet foam and the fatty lardo. I put a little heart next to the lardo in my notes, because I loved it so. The two ways the lamb came were braised in barley milk, served atop a little bed of bulgur wheat, and roasted, simply but perfectly. 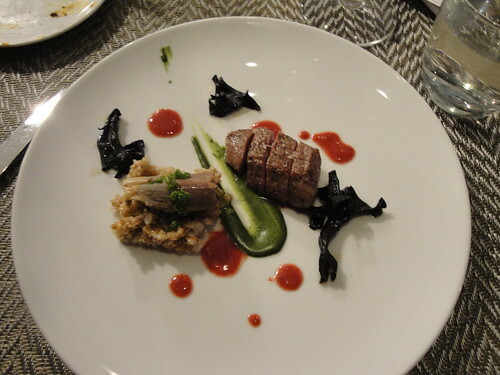 The accompaniments were blackened pistachio puree and autumn olive puree. (Our server helpfully explained that autumn olive is not really an olive, but sort of a berry. I helpfully explained that I was well aware of what an autumn olive is. I fear I have not totally mastered the gentle art of smiling and nodding.) 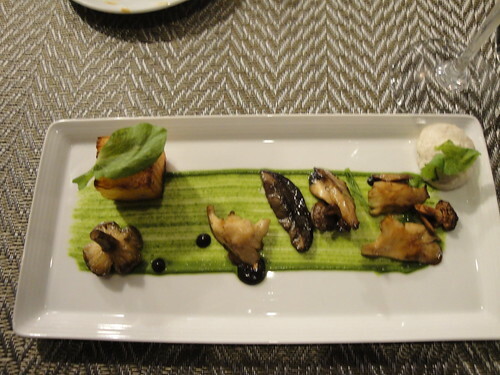 There were also black trumpet mushrooms on the plate, which were pleasantly chewy, but unexciting. Unlike the rest of the dish, which was VERY exciting. The braised lamb was very tender and its little bed tasted, fascinatingly, of almonds. The roast lamb, while it sounds boring, was divine. Tender, cooked to perfection, everything a little lamb should be, and the purees just enhanced it. A lovely fall meal. Prior to dessert coming, we were informed, a palate cleanser would be served, and after dessert there would be a surprise “thank you.” We asked if we could try the milk punch with dessert, since we’d not selected a dessert wine (it was actually what sounded like a very good vermouth) as part of our beverage pairing. 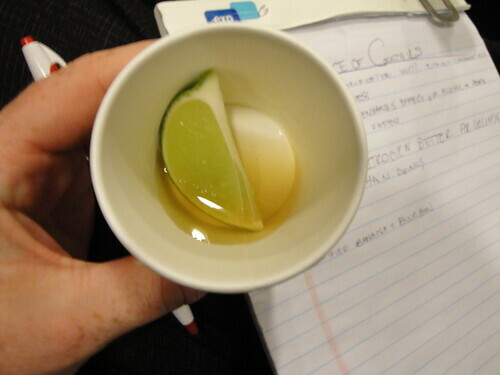 Alas, we were told, the milk punch was nearly gone, but there would be enough for us to sample it. Huzzah! The palate cleanser was delightful, a greek yogurt ice cream atop a watermelon gelee. Watermelon is not the most aggressive flavor, which I suppose is appropriate when cleansing the palate, but it was sweet, which partnered nicely with the tart ice cream and a wee bite of chiffonaded mint. The beverage fellow was the most enthusiastic I saw him all night when we asked about the process of making the punch (he was perfectly lovely the rest of the night, just a bit soft-spoken. This brought him out of his shell.) 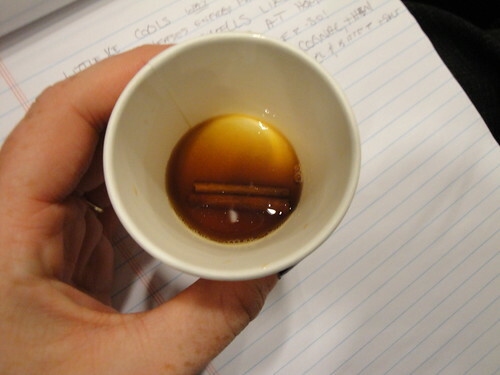 For those who don’t know, milk punch is made by combining liquor (traditionally brandy or rum), milk, and citrus. 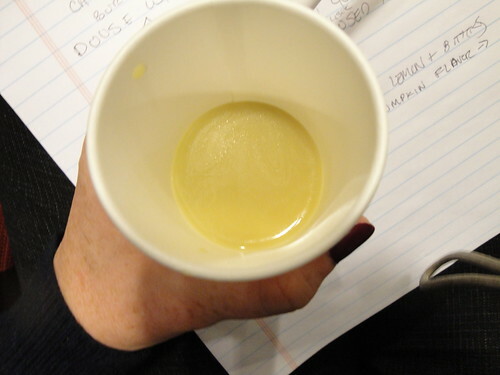 The citrus curdles the milk – you then strain off the solids and are left with a clear, but still creamy, liqueur, which can then be flavored how you like. This one was meant to taste like a root beer float, and the root beer taste was very clear. I smell a project coming. Our dessert proper, the “Three Apples,” came next. 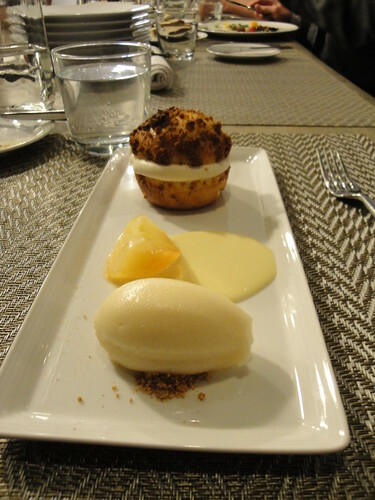 That’s a brioche filled with Scotch cream, a caramelized apple with Madeira creme anglaise, and an apple sorbet atop house-made graham cracker crumbs. I think I liked this last the best – it was intensely, purely apple. The others were pleasant, and I liked the smoky Scotch cream, but if I’d had my druthers I’d probably just as soon had another plate of lardo. In the battle between sweet and salty to win my heart, salty takes every round. 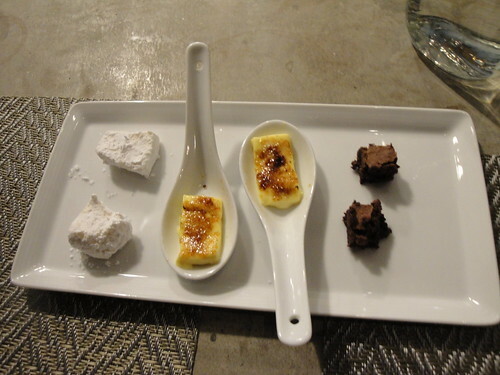 Housemade marshmallows, super-dark chocolate brownies, and the teeniest little creme brulees you ever saw! Isn’t it cute? The marshmallow tasted of lemon, and the brownies were barely sweet and intensely fudgy, which love. Since I am not a huge fan of custard, but a GIANT fan of burnt sugar, this was also just about the most perfect helping of creme brulee I can imagine. All told, Journeyman did not disappoint. It’s definitely not an everyday sort of meal – it’s expensive, and the presentation is all about theater and lingering over your meal. But if you have something, or several somethings, to celebrate, I can’t think of a more intimate and lovely way to so! Also, they’re working on building an attached bar, called Backbar, to open sometime soon. You better believe I’ll be checking it out! This is the story of two little ladies who embarked on a quest, and ended up finding far more adventure and magic than they had even imagined! Or maybe it’s just the story of two friends trying to make dinner plans, and finally getting around to it. But they were truly AMAZING dinner plans, as you will soon see. Fantastic, even. It all started nearly a year ago, when I read about a new restaurant that had opened up in Union Square. 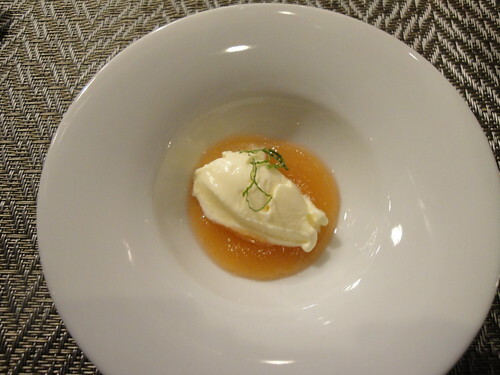 I don’t remember where I read about it, truth be told, but I was enchanted by the description – super local, super seasonal set dinner menus of 3, 5 or 7 courses, with a few molecular gastronomy-style flourishes. Not the sort of place you could enjoy some good old-fashioned down-home cooking, but rather a stage on which to enjoy the whole experience of food. I wrote to beloved dining companion Nandi, and we made plans to head to this restaurant, this Journeyman, as soon as a suitable celebratory occasion presented itself. And present themselves they did! She won a football pool, and got the job of her dreams! I got betrothed, and finished a prestigious leadership workshop! We both ran countless races, including a second marathon, and STILL WE DID NOT GO. Finally we decided to just make the reservations, already, and celebrate the whole lot of it, occasions be damned! Would Journeyman be able to live up to a year of build up? We arrived spot on time for our 7:00 reservation, to discover we were the first patrons of the evening. 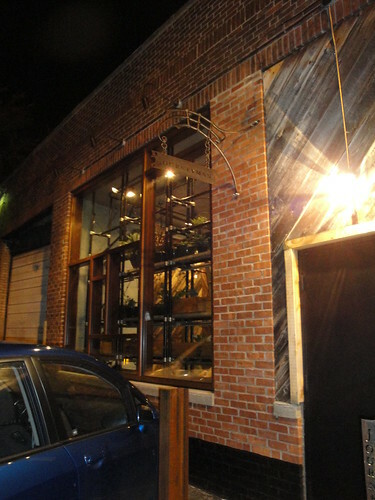 The space is modern yet cozy, with plants filling the front window and a lovely bar in the middle at which we were encouraged sit if we liked and watch the chefs. Of course we chose these seats – I prefer to sit at a bar rather than the middle of the room whenever possible – and we were off. We chose the 5 course, omnivore meal, after determining that none of the fish were shellfish, since they are Nandi’s deadly enemies. 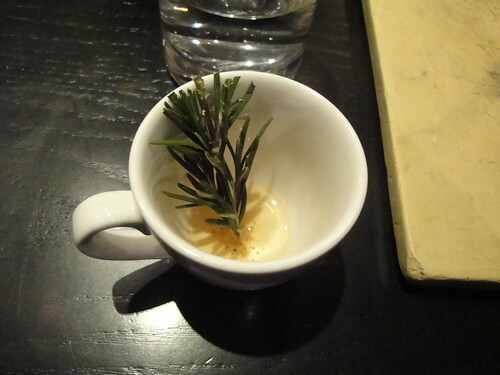 Our server, a dapper young man, assured us they were not, and brought us an amuse bouche to start our journey. This was a whipped confit of tomato with garlic toast. 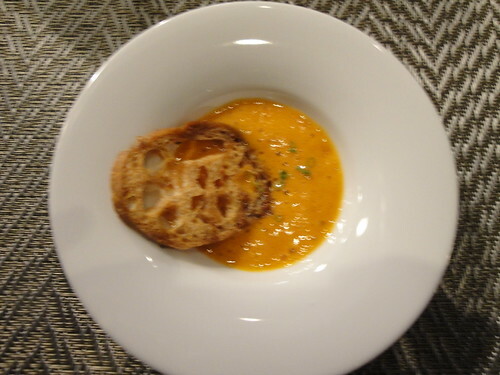 The tomato was a veritable umami bomb – however it had been confited had rendered it into the most savory foam imaginable. 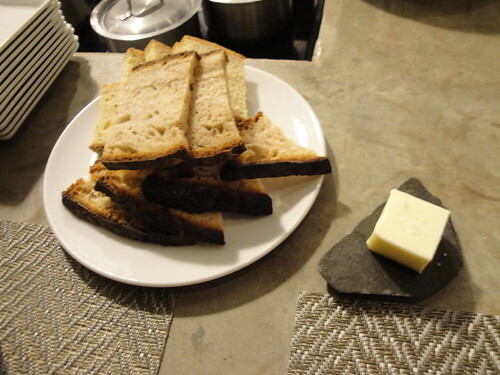 The toast was deeply garlicky, crisp, and browned. During this course a young couple joined us at the bar, and we listened to them ask questions of the staff, my favorite being when the young man asked how the “Underage Teenager” Mezcal got its name. “A false cognate,” the serious young beverage manager assured him. Because I couldn’t help myself, we added an ala cart charcuterie plate to our meal. 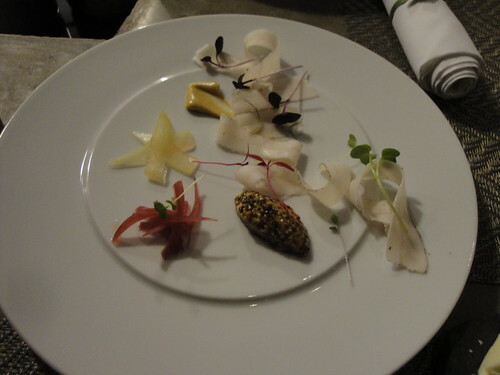 I know, I know, we already had five courses, but they had lardo! They cure it in-house, and I’m a wee bit obsessed with the stuff in general. And now, very likely, so is Nandi. She declared it “the best morsel of food I have ever put in my mouth,” and indeed it was nutty, salty, and decadent – so thinly sliced as to melt on the tongue, and paired with delightful little pickled vegetables and seriously tasty mustard that contrasted perfectly. It came simultaneously with our salads, which faintly embarrassed our server, I think, but bothered me not one whit. 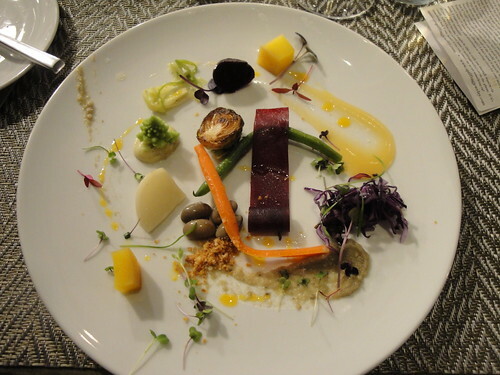 As you can see, the salad is deconstructed (or composed, but thankfully not decomposed), wee little veggies portioned off to play nicely with different sauces, looking gorgeous on the plate. The best tidbit was the Brussels sprout, cooked as it was in clarified butter. Following the salad was the mushroom course, an assortment of wild,locally foraged mushrooms served on a ramp puree (they freeze them in the Spring for just such an occasion!) and alongside a potato “galette” and mushroom foam. This was quite the parade of fall flavors, even the normally vernal ramps. The potato was a buttery little wonder, and each mushroom had a distinct flavor and texture, ranging from nearly identical to the meaty chew of an oyster to delicate and shockingly sweet (that little round fella in the center). The mushroom foam was ethereal on the tongue and tasted surprisingly of lavender. Tune in later this week for the exciting conclusion of our meal – will our intrepid young food adventurers make it to dessert? Will their quest for milk punch ever be fulfilled? Find out here! 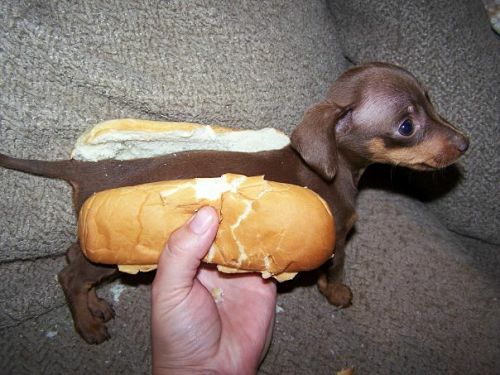 Hot dogs are one of those foods that really define a person, I think. People either think they are disgusting tubes of processed meat, or they love them with a nigh-religious fervor. Personally I, like all right-thinking people, fall into the latter camp. I mean, what’s not to love? Sure, they’re not the healthiest dinner choice in the world, but what sausage is? Here in Boston we are fortunate to have some world-renowned hot dogs. There are Fenway Franks, of course, and Spike’s Junkyard Dogs (yeah, they originated in Rhode Island, but we lay claim to more locations now.) These are good dogs, to be sure. Fenway Franks have the weight of history behind them, and Spike’s has a variety of toppings to test your hot dog imagination. But for my money, only one venue can claim the spot of top dog, and that’s Boston Speed Dog. It sure as heck isn’t due to the atmosphere. Boston Speed Dog is a hot dog cart in Newmarket Square, literally sitting in the center of a parking lot for several meatpacking companies, fishmongers, and fruit wholesalers. The walk across this parking lot if you visit by T, as I did one day this summer with my intrepid co-workers, is nothing short of harrowing – giant trucks barreling in and out of the lot, giant drivers honking and leering aggressively out their windows. 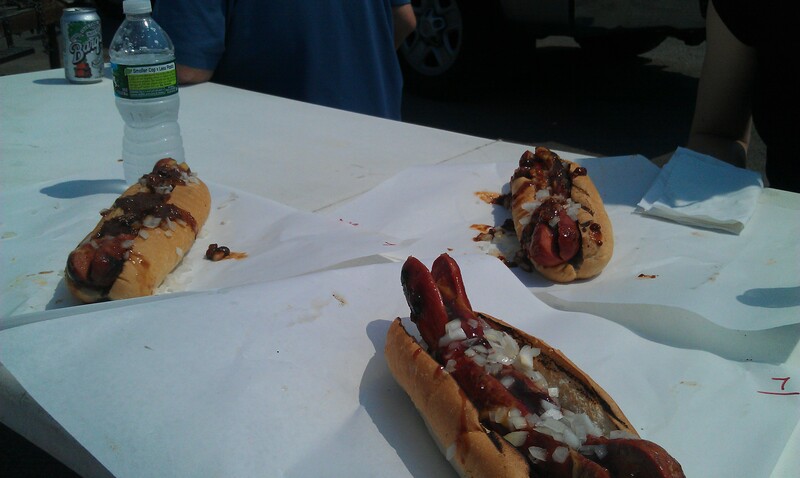 However, the slog is worth it, because these hot dogs are amazing. To start with, they are huge, 8 inches and a half pound each. This is good, because you’ve traveled a long way for them. 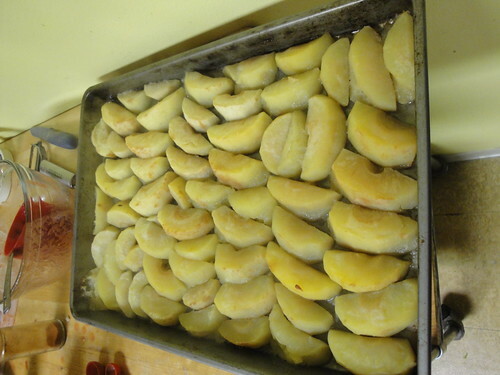 Add to that the magical process whereby they are cooked – simmered in apple cider and brown sugar, then grilled. These puppies are sweet, salty, and savory all at once, and they have a terrific snappy skin. Finally, it’s all about the toppings. Mustard, a house-made, cranberry-based relish, BBQ sauce, onions, and chili sauce – it sounds and looks like a big mess but it is so, so good. 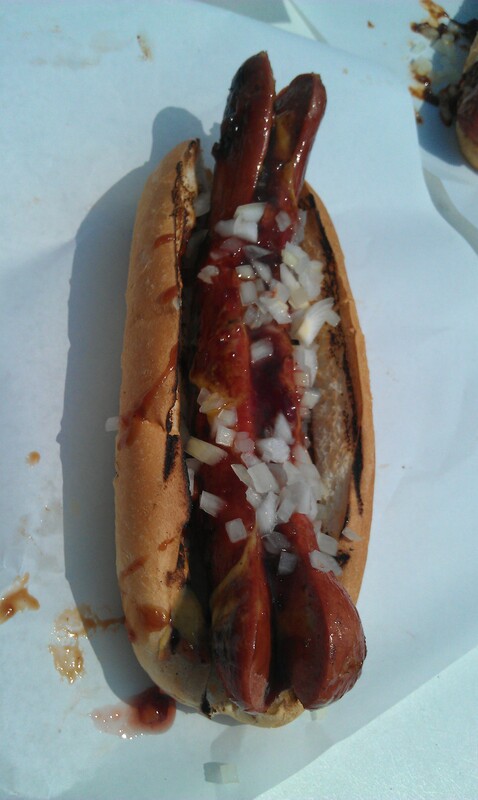 All of that sweetness is balanced out by the spices and smoky taste of the dog and the tang of the onions. I can’t see getting it any way other than fully loaded. There’s only one tiny table to sit at, but we cheerfully shared with two young men, one of whom was an enthusiastic proponent of the Speed Dog. He seemed to have been coming there since he was a wee tyke, since he knew current owner, Gregg Gale, and seemed to remember the original Ezra “Speed” Anderson. He’d clearly been several times over the summer, and expounded on his theory that you needed to embrace the messy nature of the dog. 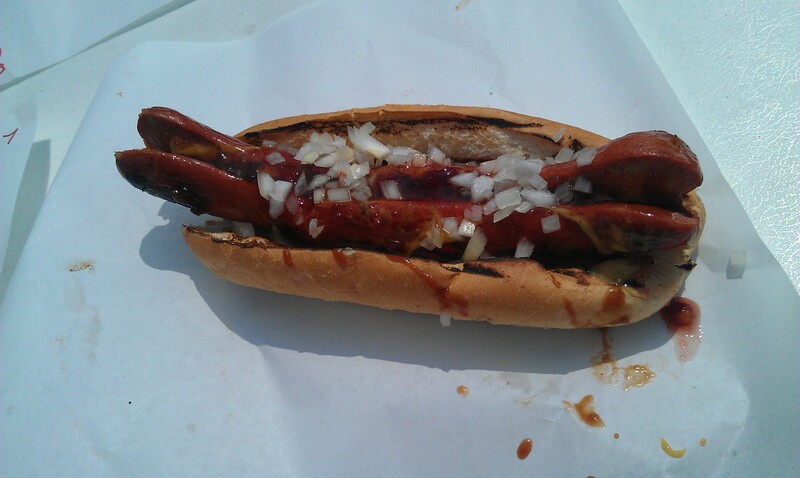 He chuckled wryly and said, “It’s not a great date place.” I disagreed, pointing out that you could learn a lot about a potential paramour if they were willing to sit in a meat-packing plant parking lot, eating the messiest hot dog known to man. That said, I’d save it for a fifth or sixth date – and bring lots and lots of napkins. Special thanks to Karleigh Rose for the pictures on this post!